A large number of the super-rich of the country are leaving India every year for various reasons. According to Global Wealth Migration Review 2019 (GWMR) published by the AfrAsia Bank and research firm New World Wealth, around 5000 super rich of India migrated from the country during 2018. However, in terms of percentage, just 2% of the high net worth individuals (HNWIs) have migrated from the country. As per the report, the highest exodus of the super-rich was visible in China where 15,000, or 2% of the HNWIs left the country. 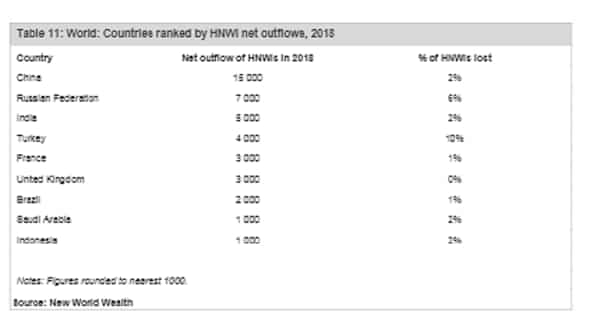 China is followed by the Russian Federation where 7000 HNWIs (6% of the total) left in 2018. India is at the third spot and followed by Turkey, France, United Kingdom, Brazil, Saudi Arabia and Indonesia in the top 10. In Turkey, 10% of the super rich left the country last year. The reasons attributed to migration of HMWIs include safety - woman and child safety especially; lifestyle - climate, pollution, space, nature and scenery; financial concerns; schooling and education opportunities for their children; work and business opportunities; taxes; healthcare system; religious tensions; standard of living; oppressive government. The top cities of the world that witnessed inflow of over 1000 HNWI migrants include Dubai, Los Angeles, Melbourne, Miami, New York City, San Francisco Bay area and Sydney. Among countries, Australia witness the inflow of 12000 super rich from across the world. It was followed by the United States, Canada, Switzerland, United Arab Emirates, Carribean, New Zealand, Singapore, Israel, Portugal, Greece and Spain. The Carribean includes Bermuda, Cayman Islands, Virgin Islands, St Barts, Antigua, St Kitts & Nevis etc. According to the report, the possible reason for Australia becoming the top choice for migrating super-rich include low crime rate in the country, the appeal of bringing up children and going to school/university in the country, English speaking population etc. Australia also has a growing economy. It is "one of the few high income economies that has grown strongly over the past decade." Unlike most other countries, there is no inheritance tax in Australia. "This encourages the rich to stay in the country and grow their businesses for the future generations," says the report.